Help the CBLDF Defend Comics on Free Comic Book Day! This Saturday, May 5th, people will gather at comic book shops around the world to celebrate Free Comic Book Day! 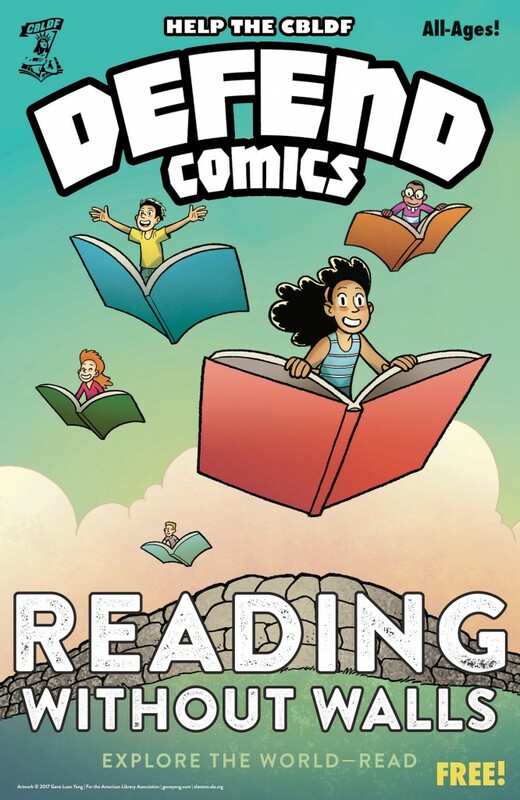 Don’t forget to pick up CBLDF’s Defend Comics, featuring a special Reading Without Walls cover by Gene Luen Yang! This year’s comic has stories the whole family can enjoy together, with tales by Jorge Aguirre and Rafael Rosado (Claudette Shuts Up? ), Boya Sun and Kate Reed Petty (Chasma Knights), Emily Tetri (Tiger vs. Nightmare), Charise Mericle Harper (I Can Say…), Drew Weing (The Creepy Casefiles of Margo Maloo), and John Patrick Green (Kitten Construction Company: Meet the House Kittens). Some stories can open up a dialogue about the First Amendment with children, but all are sure to delight parents and kids alike! So pick up a copy and read it together, and don’t forget to support your local comic shop!